Kinda nice, but Rin’s voice wears on me here. I can see why this is wearing out its welcome, its good in all aspects, but just isn’t unique. New to me, and this is awesome! Love the illustrator’s Luka impression. More by this P pls. Probably need to be fluent to completely appreciate this one, not too musically appealing. Good use of Gumi for a style she shines in, I like this. If the clip hasn’t sold you listen to the whole thing. Another bounce back for Rakshasa, I’m new to it so I don’t mind yet. Good song to get in the Halloween spirit. 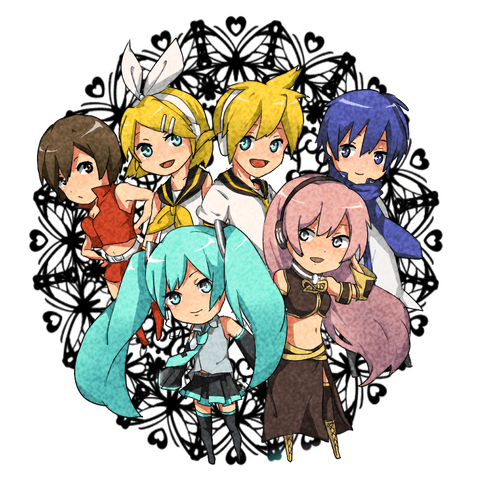 People, let’s go dig up the Rin/Len version for variety, that had merit too. wowaka still rules. Sick beat keeps me from worrying about weird background art lol. Creative outreach to the Bhuddist youth, hope people enjoy it. Always appreciated this P, but this one has been making me a true fan. Nevermind quality (which is good), what is up with the new found Vocaloid pop spirituals section. This isn’t offending people somewhere is it? THIS. More of this from Rin pls, great job emon. Ok….no offense if I am missing out on the biggest meme ever or something, but is this troll? Once again this is good, but Gumi gets generic with this sometimes. Some darn good “mature” Luka here. Lol its like a Rin-Append of Miku…but jk this is a pleasant song. I don’t see the appeal, its not even delightfully creepy or tantalizingly insane. Was losing faith in the list a bit till the voters “preserved” this one up the chart. Low ranking week is just that. Pretty, and ok staying power. I now see how this one got up there last week, it gives you what you expect but with enough catchiness that it becomes one of those “playlist” songs. This Gumi tuning really jumps out at you, I like what monaca is doing alot. Still wierd, in that good way. H5: Ah, re-living the birth of a classic. Even better when you watch it in concert. H2: Is this the only song by mikumix? I found this when I discovered his site last week, I like it alot, nice PV too. H1: Would be easier to reminisce about this classic if it ever went away, but thankfully epic wowaka lives on. OneRoom’s Miku-tuning always makes me soft, and I really like this. The ONLY one I will put on my Itunes for posterity, all the rest can just leave kthx. Do not want!!! Perfect, calm ED, over 9000x better than #1, I will fall asleep to this tonight just cause. Hope everyone sorta enjoyed the VocaRan this week. Enjoy it for me cause I really didn’t. 2, 4, 6, 8, and 10 at least tell me there will be light and the end of the tunnel. I’ll let the others comment on the Sutra meme stuff cause I don’t get and don’t want to get it lol. You can see how disheartened I became as I continued to watch the program in horror. Have a great night and fabulous day tomorrow. I’m very glad to be back and will be around more! Its the Heart Sutra from Buddhism. Its often set to music by Chinese and Hong Kong musicians. I don't know why it suddenly got popular but for whatever reason it is. Was expecting more of Heart Sutra to be honest. It's likely to come back once the Heart Sutra fever dies down. Yeah was under the impression that its pretty much a permanent fixture.